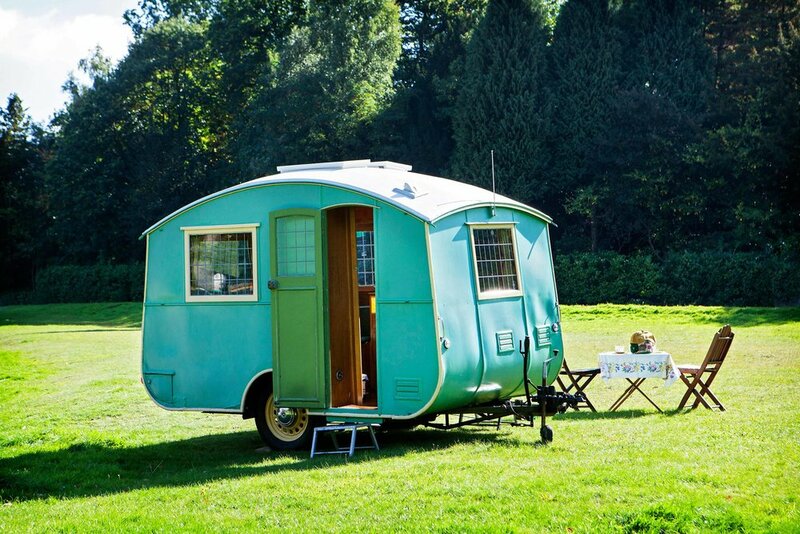 Parked in a meadow, a tiny, mint green caravan is ready for the road. A lovingly restored Winchester Imp, it was hand built in 1939. Today, it is the only survivor of an original four. At 11ft long by 6ft 3in wide (3.3 x 1.9m), it is truly tiny. Despite this diminutive size, it has provided owners George and Angela Windsor with comfortable accommodation for up to 10 days. They take it on three holidays a year as well using it when visiting family and friends. It has been towed the 220 miles from their home in Surrey to Hull. As members of the Historic Caravan Club, they regularly attend events and rallies throughout the year with the Imp. The Winchester Imp was made at the works of Mr Bertram Hutchings Caravans Ltd, of 124 Stockbridge Road, Winchester, Hampshire. The company was founded in 1912 when its first caravan, a 14ft (4.2m) model, light enough to be drawn by a single horse, rolled out of his workshop. In 1930 the first streamline design was launched. This was a more curvaceous, less boxy ’van which was easier to tow. It was named the Winchester and from then on, the name stuck for all Hutchings caravans. Pre-Second World War exquisitely handmade caravans were expensive and made to order. On 7 June 1939, the Windsors’ Imp was delivered to Mr and Mrs Jack Fellows, of Cradley Heath, Birmingham, for the sum of £145, the equivalent of more than £3,500 today. The very same day the Fellows towed their new Imp to Scotland for a touring holiday. Unprecedented for caravans in the 1930s, the Imp has two doors, the main one still with its original leaded light windows. “It makes a big difference when using the ’van because when someone is standing at the sink you can go out the other door,” adds George. The curved fibre-board roof has a thin canvas overlaid on top, painted with lead white paint. Two centrally placed opening skylights are incorporated into the roof. “The skylights provide a lot of daylight and fresh air, and it’s lovely to lie in bed and look up at the stars,” says Angela. Both roof and skylights needed repairing. The entire roof was repainted using paint with fibres in it for strength. Then early last year, George stripped the paint from the skylights to bare wood. Sections where one skylight had rotted were repaired. Both were then primed and repainted using the white roofing paint. There were cracks in the Perspex so both were re-glazed in Plexiglass. He has repainted the exterior green, but hesitates at repainting the signwriting above the rear window. This reads ‘1938 Winchester Imp’. “The year is incorrect and I’ve thought of repainting it to ‘9’, but I couldn’t guarantee it would look convincing. It’s a dilemma,” he says. The pressed wheels have been stripped and shot-blasted. He then powder-coated them in a rich cream colour. This is a type of dry coating, applied as a free-flowing, dry powder. The coating is applied electrostatically and then cured under heat to allow it to flow and form a skin. It creates a hard finish and is tougher than conventional paint. New Excelsior tyres and inner tubes were fitted. The wheel bearings were re-greased and the automatic braking system adjusted. The Imp was ready to go. There are four main windows, the largest at the back. There is good cross ventilation on a hot day when they are all open, together with the doors. The original glass in the windows would have been clear, not the leaded lights there now. George, however, has no intention of changing them. “It would feel like I was stripping out some of its originality. I don’t want to remove what has been there for over 22 years,” he says. Besides, he adds, they look nice and are safer if the glass breaks. The interior is compact, with its original well-crafted oak veneered drawers, shelves and cupboards. It also contains some wonderful details. On one side are what appear to be built-in cupboards and drawers. 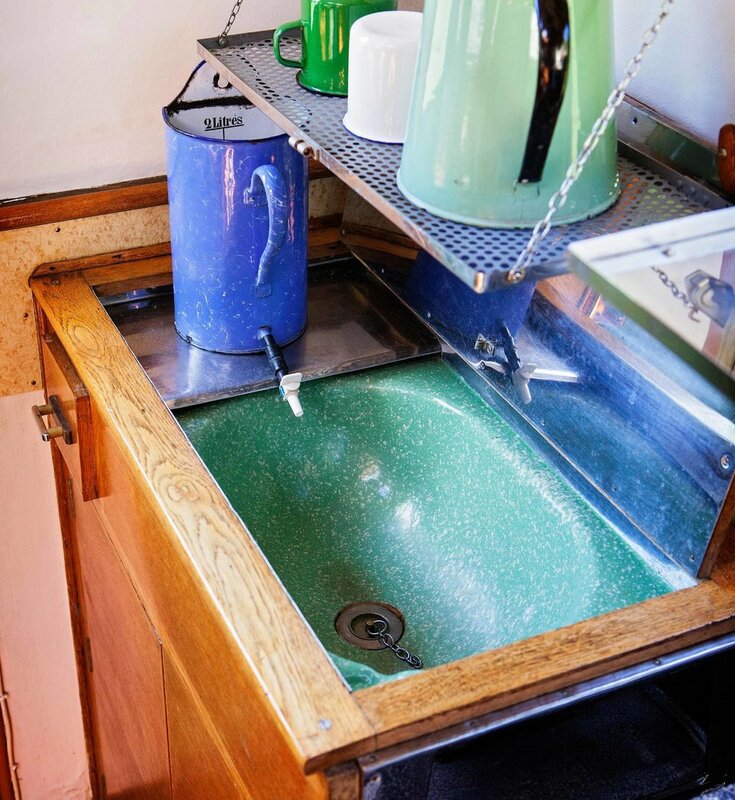 Lifting a timber leaf, however, reveals the original sink of pressed steel with a green vitreous enamel coating. Over the sink is an in-built stainless steel panel with a stainless steel drainer that cleverly folds out. Another wooden counter top, lined underneath in stainless steel, sits next to it. This lifts up to reveal the original Bottogas cooker with two burners and a grill. Both the cooker and sink were in a good state of repair when the couple bought the Imp. A unique feature is a built-in chest of drawers located near to the stove. This includes a lift-up top lined in stainless steel so that hot pans and food preparation can be carried out. The wall panels are white painted oil-tempered hardboard, single skin from the waist up and double skin below. The ’van was designed for summer use so the single skin hardboard did not need the same thermal insulation properties of the double skin. The single skin was cheaper, and lighter, making the ’van lighter to tow. The double skin is stronger and is better able to protect the cupboards and furniture. George had eggshell paint mixed to match the oak woodwork. He then spent many painstaking hours painting over the pink to get the interior back to a more sympathetic appearance. The couple then set about matching the interior furnishings to the new exterior colour scheme. The cushions did not fit properly and both they and the curtains were pink. George and Angela wanted a more period looking colour. So new comfortable cushions were made to order, covered with subtly-flecked green fabric. Further into the ’van is a wardrobe with a mirror fixed to its external face. When the table leaf is folded away, it is clipped to the inside wardrobe door. At the bottom of the wardrobe door, is the original stainless steel chrome-plated brass Bottogas Tom Thumb gas fire. At the moment, it is missing its mantle, so cannot be used, but George is hopeful he can get it working again. The original 12-volt ceiling light has been converted to use LED bulbs without affecting its appearance. The ’van still needs some bodywork restoration in parts. This will be done as part of a rolling programme as time allows. “I have the practical experience and I don’t find the work challenging at all,” says George. It is the history attached to a vintage caravan that is so attractive to George and Angela. That, and the fact that they are so lovely to look at. “We see the beauty in the Imp’s construction, its shape and quality materials,” he says. And they are not the only ones. Angela says that whenever they attend vintage rallies they often have a hard job getting out of the Imp due to people queuing up to look inside. “People say, ‘oh, it has two doors and parquet flooring’. They are amazed by it,” she says.